This story started with a recreational caving trip to the Rising Star cave system northwest of Johannesburg in October 2013. Two cavers, Rich Hunter and Steven Tucker, decided to take to an unknown section of the cave. Entering what is now called the Chute, Hunter and Tucker lowered themselves 12 meters down to an unexplored chamber of the cave, which was later named the Dinaledi Chamber, Dinaledi being the Sesotho word for Stars, thus the Chamber of Stars. Here, the two discovered a trove of fossil bones, which they photographed, and then showed the photos to Professor Lee Berger at the University of the Witwatersrand (Wits University). The Dinaledi Chamber turned out to contain 15 fossil skeletons of an extinct species of hominin. Berger’s instincts told him that what they stumbled upon would forever change the understanding of “where we come from” and he proved right – the Dinaledi Chamber turned out to contain 15 fossil skeletons of an extinct species of hominin (human ancestor), provisionally named Homo naledi. The discovery provided evidence for their complex ritualistic behavior, such as disposal of the dead in a separate chamber, which was long believed to be a uniquely human feature. Berger decided to initiate an expedition and set out a call on social media. The cavers and scientists had to pass through small holes, climb the Dragon's Back (a 15 meter rock climb within the cave) and then pass down the 12 meter Chute where they would encounter an 18 cm gap. An initial three weeks’ expedition took place in November 2013 to recover the hominin remains from deep inside the Rising Star cave. Accessing the fossils was no easy task – the cavers and scientists had to pass through small holes, climb the Dragon's Back (a 15 meter rock climb within the cave) and then pass down the 12 meter Chute where they would encounter an 18 cm gap. The Dinaledi Chamber is only accessible by relatively slim individuals, as the area of the cave leading down towards the chamber is extremely confined. Six experienced paleoanthropologists, archeologists and anthropologists were chosen to undertake the excavations. After the first expedition, it was evident that the remains of the hominin found in the chamber were in fact the remains of at least 15 individuals, and a second two-week long expedition took place in March 2014 to recover the rest of the material. The use of traditional excavation recording equipment was rendered useless, and a new approach to collecting high-resolution spatial data was needed. 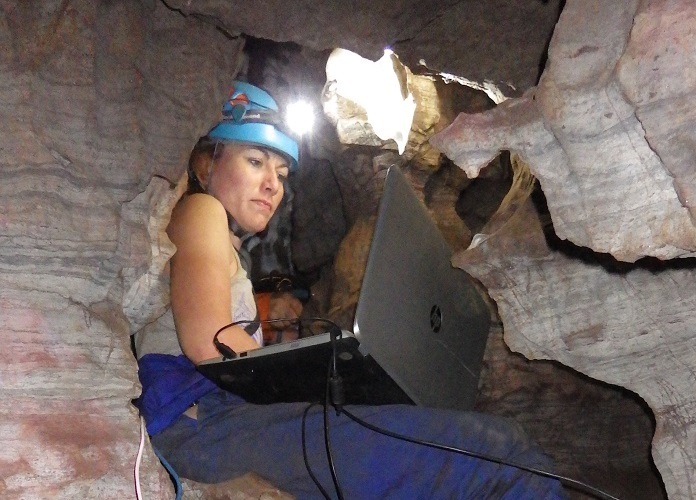 Due to the constraints of the Rising Star cave and the Dinaledi Chamber, the use of traditional excavation recording equipment was rendered useless, and a new approach to collecting high-resolution spatial data was needed. One of the people that acceded to Berger’s call was Ashley Kruger, who was completing his Master’s degree at the Evolutionary Studies Institute, Wits University and was looking for a PhD project in Paleoanthropology. Kruger joined the project in October 2013, just before the first excavations were carried out at the Rising Star cave. Fossil position recording was completed with Artec Eva. Fossil position recording, usually undertaken with a grid system, or total station, was completed with Artec Eva. Kruger collected scan data from the excavators, renderd and fused the data, and then compiled the different layers of excavations in 3D to piece each recovered element together and place it within a larger spatial context. 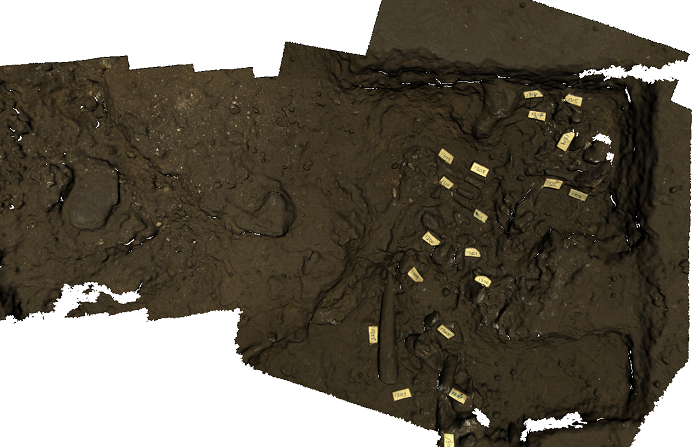 This image is made up of scans taken at four separate stages during the excavation process. The brown base layers show the limits of the excavation pit, whilst the blue and orange layers show the fossils being excavated on two separate days in March 2014. The articulated elements of a fossilized hand and part of a lower limb can clearly be seen. The image first appeared in the article “A new star rising: Biology and mortuary behavior of Homo naledi”: RANDOLPH-QUINNEY, Patrick S.. A new star rising: Biology and mortuary behavior of Homo naledi. S. Afr. j. sci.[online]. 2015, vol.111, n.9-10, pp. 01-04. ISSN 1996-7489. Artec Eva was used to scan the excavation area which included the fossils in situ (still in the sediments). “Sweeping” the desired area with the scanner produced a real-time visualisation of the area on an accompanying laptop computer. 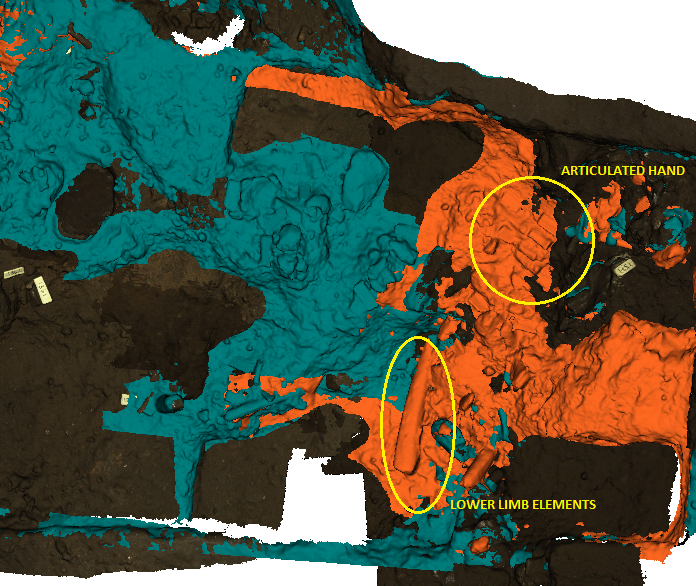 Then the layer with the fossils (never more than 5 cm thick) was removed and the uncovered surface was scanned with Eva. The excavation area within the Dinaledi chamber of the Rising Star system during March 2014. 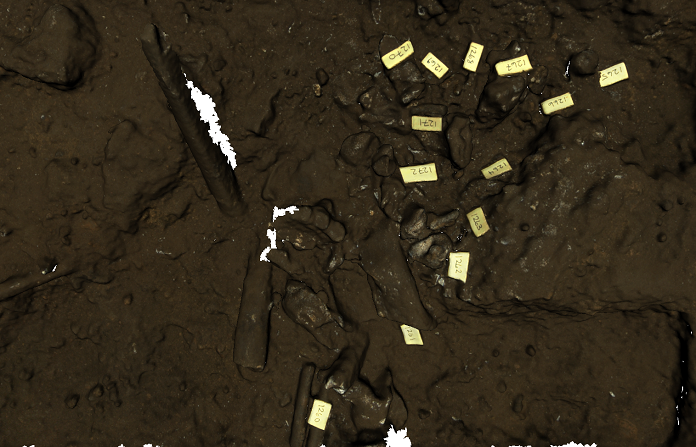 The image shows a number of articulated, as well as unarticulated remains which were recovered after this scan was completed. 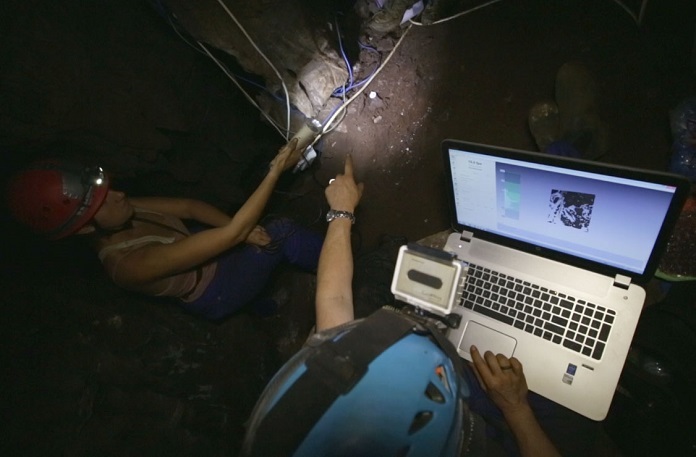 Documenting the excavations within the Dinaledi Chamber with Eva served two purposes. First, spatial data about the location, orientation (axial and surface) of every bone was collected. And second, the data recorded during this process was transported to the surface after every scan, to allow for scientists above the ground to provide guidance and direction to the excavators concerning excavations and recovery. A close-up of the excavation area within the Dinaledi chamber, showing the many remains of the featured layer of excavations. A maxilla (center) is clearly visible. Ashley Kruger testing Eva on a colleague, John Hawks. Photo: Twitter account of Rising Star Expedition. The team above the ground watch as 3D scans are rendered during excavations. 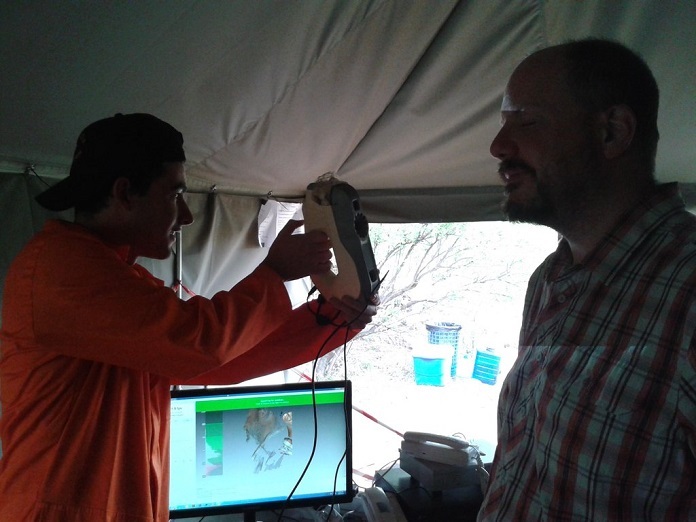 The 3D scans were used to document the excavations as the scientists proceeded. Post-processing was managed in Artec Studio 9 (and more recently Artec Studio 10 Professional). Each scan “sweep” comprised a number of separate images compiled into a single layer. Each scan was then registered to acquire 3D triangulated points. Once registration was complete, the separate layers were manually aligned, by using a minimum of three reference points. These reference points were a combination of fixed survey markers within the Dinaledi Chamber and physical attributes of the excavation area, which were captured in each scan to provide optimal registration. Once alignment was complete, global registration allowed for the scan data to be merged accurately. This produced a 3D mesh representation of the scanned area. The 3D mesh was then overlain with a photographic texture map, which was captured by Artec Eva concurrently at the time of scanning. After compiling each 3D scan, the surface scan was exported and was then stitched together to create a composite surface scan from multiple scans. This allowed for the excavation areas and chamber to be visualized in a 3D environment, through the excavation progress. Two excavators scan the excavation area of the Dinaledi Chamber with Artec Eva, prior to removing the fossils.